Police arrested two Canadians and an American who allegedly posed as brokers of security firms in Muntinlupa City today. Picture courtesy of the National Capital Region Police Office. 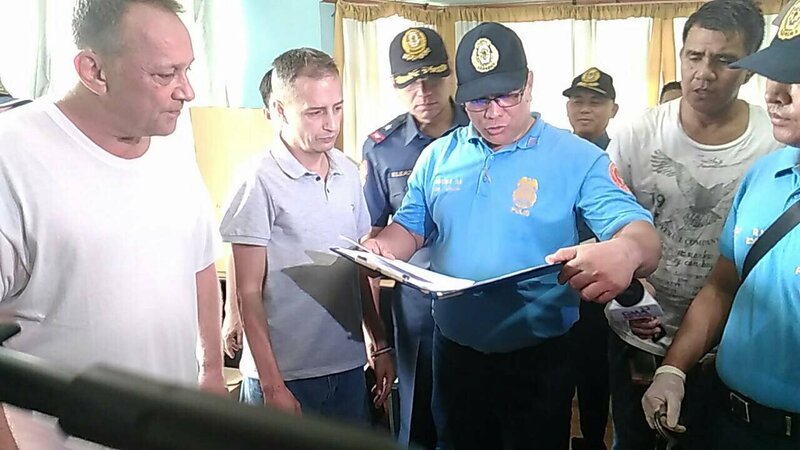 Two Canadians and an American have been arrested in Muntinlupa City for posing as brokers of security firms in an alleged boiler-room scam. Police identified the suspects as Jesse Scott, aged 47, and Barry Rosen, 60, from Canada, and American Richard Racioppi Jr, 56. The suspects were arrested at 6.25am today (Wednesday, August 15) at Racioppi’s house on Ormoc Street in Alabang Hills, Cupang. Another suspect, Jeffrey Scott Rosen, was not present when the police swooped on the premises. The suspects allegedly introduced themselves to their victims as brokers of security firms in order to fraudulently obtain money, authorities said. Police said they received a report from a certain Ken Gamble saying the three were involved in a transnational crime syndicate operating in Metro Manila. The suspects allegedly offered high returns for bogus investments. They put up online sites and made follow-up calls to lure their victims to buy stocks. During the raid, police seized several computers and sales scripts, bank transactions and a 12 gauge shotgun. Initial investigation revealed that Racioppi is married to a Filipina and has beens staying in the Philippines for almost 19 years. Police also found out that Barry Rosen was the chief executive officer of a company called Biathlon Incorporated, which is based in Hong Kong. He had been staying at the house of Racioppi for almost a week. Authorities said they were in the process of informing the Embassy of Canada and the United States Embassy about the incident. The three will be charged for violation of Republic Act 8799, or the Security Regulation Code in relation to Republic Act, and RA10175, or the Cyber Crime Prevention Act of 2012. In April last year, we reported on the arrest of three British men, along with 35 of their staff, for running a similar boiler-room scam. Andrew Robson, Graham Allan Bennet and Dominic Whellams were arrested by an anti-cybercrime team at their office in Carmona, Cavite. Please deport these Pests right away, the Philippines have enough of them already, and their headquarters is called the “Batasang Pambansa”.